They're certainly not resting on their laurels at Cheltenham's Bad Shepherd. Despite only opening their brewpub late last year and pulling in big crowds (and a great review in Good Food) since, they keep banging out the limited releases. Hot on the heels of the fine recent Red IPA comes a beer with the cooler months on its mind. 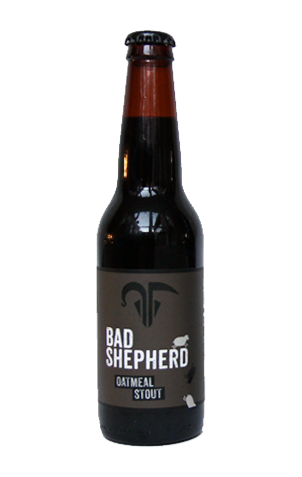 The Oatmeal Stout is their take on traditional English beers of the style and thus comes with lower carbonation than you expect in most Aussie brewed beers, as well as some toasted flaked oats – toasted in the brewpub kitchen, no less. It's also based on another of co-owners Dereck and Diti Hales' award-winning home brew recipes. It wears its old school credentials on its sleeve: there's no fruity hops, no big alcohol, nothing New World or quirky. Just a nigh on opaque dark brown / black stout with a thin, rapidly dissipating head that's all about roasted and dark choc aromas and flavours, and finishes pretty darn dry, albeit with a lick of cacao sweetness that lingers on the palate.